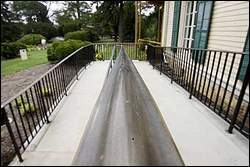 The ramp for people with disabilities leads to the entrance to Thompson Park Visitor Center in Middletown. The front door of the Thompson Park Visitor Center was unlocked Saturday to provide easier access to people with disabilities using restrooms there. Normally, the center's back door is open for access to the restrooms, but that requires navigating a staircase of eight steps. So the Monmouth County Park System, which operates the 665-acre park on the Holmdel-Middletown boundary, began keeping the front door unlocked this weekend. The front porch has a ramp leading to it for people with disabilities. The Asbury Park Press reported on the controversy Wednesday and on Thursday the Monmouth County Board of Freeholders announced plans to open the Visitor Center on weekends. But activity was light at midday Saturday around the Visitor Center, which was staffed by a park system worker. From 12:35 p.m. to 1:35 p.m., about 10 vehicles were parked in the nearby lot, for example. And, during that time, only two people were observed using the front door — an Asbury Park Press reporter and man asking for information, whom the reporter directed to the park system worker. The park system worker directed the reporter seeking comment to system administrators, who were unavailable Saturday. Various other park visitors declined comment on the issue. The center's weekend hours are 10 a.m. to 4 p.m., according to a sign posted at the front door. Joe Sapia: (732) 308-7754; (800) 822-9770, Ext. 7754; JSapia@app.com. This story contains information from a previous Asbury Park Press story.